After the Show, Spend the Night With Us! We’re located near the major theatres and concert venues. Enjoy the night out, then enjoy the night in with us! San Francisco features the finest, world class shopping in the West Coast. Make it a shopping getaway with us and book our shopping package! Checking into the Hotel Vertigo is like stepping into a Hitchcock movie – literally. Back when it was the Empire, the hotel played a cameo role in Hitchcock’s classic, "Vertigo." These days, the film plays on a loop in the lobby, and the hotel’s baroque-modern sensibility represents a head-spinning union of old and new. Wielding an incomparable eccentricity, style, and playfulness, Hotel Vertigo is a sophisticated, multi-sensory sanctuary perfectly in tune with your point of view – even if it should change from one second to the next. Check into the Hotel Vertigo and you'll realize that, "Equilibrium is overrated." 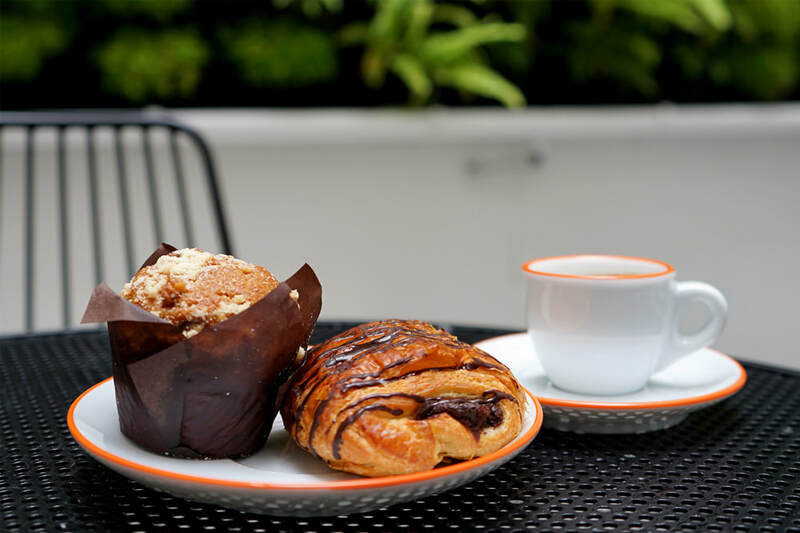 In addition to Wi-Fi in all rooms and social areas, morning coffee & pastry available for purchase in our lobby. Additional perks include a business center, an on-site fitness center by PreCor and a morning newspaper. Cafe Vertigo is now open for Breakfast! Start your morning with local pastries and coffee in the lobby. Our unmatched location places you midway up Nob Hill, a couple blocks west of Union Square, perfectly situated for San Francisco shopping and sightseeing, yet fully integrated in an actual neighborhood and tucked away from the usual tourist haunts.